Radiant your Skin Care with the [23 Years Old] Badecasil Cera3+ 50g! we aim to provide you best korean products to take good care of your skin, including Cosmetics, Moisturizer, Cream. Hydra Cream online. 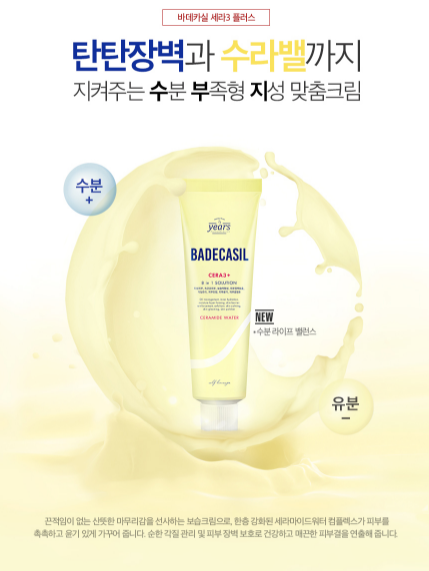 Badecasil Cera3+ is a hydrating cream with features of gentle exfoliation and skin barrier protection upgraded ceramide water complex helps the skin delight in deep hydration and healthily gleaming with crisp finish. It is effective to improve damaged skin by forming deep moisture barrier. After cleansing, Take a moderate amount and spread over face and pat lightly to absorb.